Welcome to the first blog post of iruntech.me! 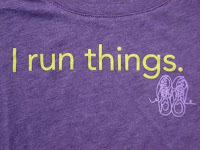 My name is Stacey Lindes and I'm @iruntech on Twitter. First, a disclaimer: I do NOT run tech...I run and love tech. When I created my twitter handle, running was (and still is) a big part of my life and I was new to the position of Teacher Resource Specialist for Technology. At the time, I was fond of a running shirt that stated "I Run Things" and after several attempts at creating a unique Twitter handle, I blurted out, "How about I RUN TECH?!?" It stuck. The handle is a little tongue in cheek, but I like it! Like many people who start a blog, this is something I have been contemplating for a long time. I've always considered myself a would-be writer. From an early age I have kept journal after journal. As an elementary teacher I shifted from keeping numerous journals to keeping writer's notebook after writer's notebook. It has always been something I do for myself and share with very few. For me, writing has always been a private endeavor. Not anymore! What changed? So many things! This year, my 13th in education, I joined the world of connected educators on Twitter (but more on that in another post). Long story short, it was there I met amazing teachers who encouraged, poked, prodded, and at times dragged me out of my shell! With their encouragement and a little pushing, I decided to create this blog. My mind is constantly running (even when I'm not). Some of my best thoughts and ideas are the result of a good run (other fits of inspiration come as I'm waking up or showering-I joke that I am washing away all the bad ideas). I have many goals for this blog: here I plan to reflect on my adventures in education with "Running Reflections", share new ideas and thinking with "Running Thoughts", and critique and analyze books with "Running Reviews". I would also like to share this space with others, so I will be hosting a guest each week during "Words With...Wednesday" (look for that next week!). If you made it this far in the blog post, I thank you; and I hope that you will join me on this marathon of a journey! And before you ask, no, I have not completed a marathon...yet! Are you a blogger? What got you started? If you're not a blogger, what's holding you back? I'd love to know. Yay, Stacey! I'm so excited to read your first blog post! Blogging has been a part of my life for the last 9 years! I got started many moons ago because a colleague was blogging with his math class and he thought it would be a great way for me to engage some reluctant learners in my class. (It worked!) From that point on, blogging on a variety of different topics has been a way for me to explore and write about many things and get to know people from all over the world. Keeping a blog is a fantastic way to share out ideas and to make reflection a regular part of your routine. This is going to be an exciting journey for you. Cheers! Excited about learning more about your tech prowess.